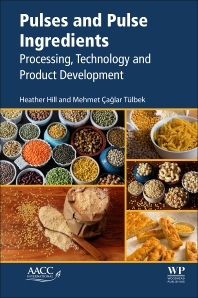 Pulses and Pulse Ingredients: Processing, Technology and Product Development is a complete and comprehensive overview of pulses, with coverage from raw ingredient to developed products. Divided into two main sections, the book opens with coverage of the processing of pulses. It begins at ingredient processing, with a focus on milling and fractionation, also covering the composition of pulse ingredients and pulse and pulse ingredient testing. In addition, readers will find sections on raw ingredients that can be derived from pulses, with separate chapters covering whole pulses, pulse flours, starches, proteins and fibers. Final sections cover technology, challenges and potential resolutions. As pulses are one of the hottest topics in cereal and grain science, this book, written by industrial researchers working at the cutting-edge of pulses and pulse ingredients, brings practical applied knowledge on this rapidly expanding field. It is essential reading for cereal and grain science academics and postgraduate students and industrial product developers in cereal and grain companies. Heather Maskus works at the Canadian International Grains Institute as Project Manager, Pulse Flour Milling & Food Applications where she is now managing the Pulse Flour Milling & Utilization Project to better understand the effect of milling methods and treatments on the functionality of pulse flours in food product applications. Previously she was the Director -Food Innovation at Pulse Canada, Winnipeg, MB, Canada. Mehmet Tulbek is the Director of Research and Development at AGT Food and Ingredients Inc., one of the world’s largest specialist pulses product developers. He is responsible for all new application and product development within the company, as well as ingredient and technology development. He also has responsibility for regulatory and compliance affairs. Previously he was Technical Director of the Northern Crops Institute at North Dakota State University, Fargo, ND, USA.